All invasive non-native species have the capacity to disrupt the natural balance enjoyed by the UK native biodiversity. These species can reproduce faster, tolerate a wider spectrum of habitats, predate more voraciously and can carry parasites and diseases that could decimate existing fish populations. Topmouth gudgeon is just one example of such invasive species. To date the team has treated 22 topmouth gudgeon sites and eradicated both the only known black bullhead and fathead minnow populations in the UK. We have developed a core group of officers that can provide emergency response and technical resilience to all parts of the UK. 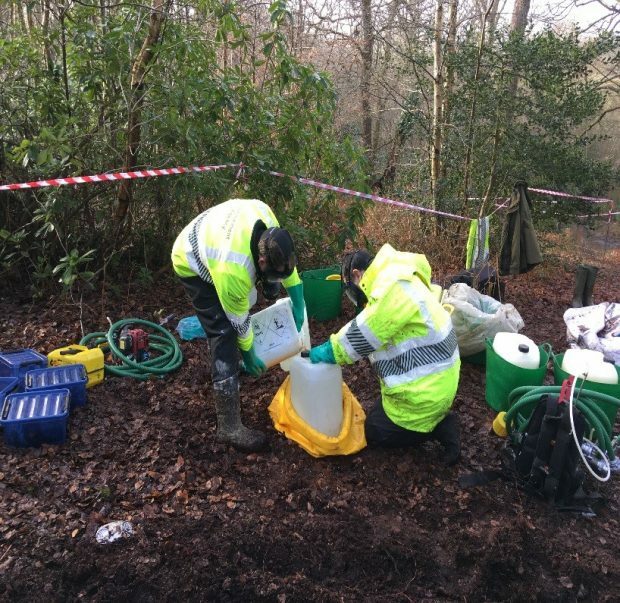 This safety net means that employees of the Environment Agency are able to include non-native species identification and awareness as part of their day to day business. Currently there are a number of sites around the county that have been affected by topmouth gudgeon. Although topmouth gudgeon are high on our priority list, the team is also involved with providing guidance on other species that will have a detrimental effect upon the indigenous fish population of Great Britain. An operational instruction is being developed to assist area teams in preliminary investigations of INNS. This will cover the trapping protocol as well as the legislative element to help secure evidence as part of the Keeping and Introduction of Fish Regulations 2015. Continuous research and development is looking into novel approaches of controlling them and preventing further contamination of sites. The team is carrying out the maintenance schedule of all the equipment that is used during the eradication process. The equipment is potentially being adapted to be used for the application of other chemicals. The team is already trained to use the equipment and have at their disposal all of the relevant PPE. Developing the scope to apply alternative chemicals means that the virtual team is able to broaden its horizons to eradicate INNS and not just fish.